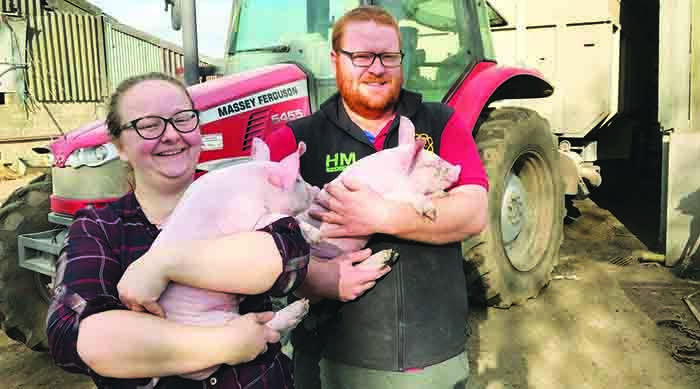 Husband and wife team Tom and Cassie Mapes are reaping the benefits of career switch, which resulted in a job- share at A&B Leamon & Sons, a 330-sow family-owned and run pig farm operating on a farrowing-to-finish basis, with indoor accommodation. Tom and Cassie began working on a job-share basis at the farm in October 2016, after they embarked on a career move when a stockman position became available on the farm, which is run by Tom’s family. Prior to joining the business, Tom was a welder fabricator, while Cassie was a podiatrist. Two years later they were named Trainee of the Year at the 2018 National Pig Awards. Tom said: “The whole job share started as an idea which would allow us and the farm flexibility with work. The idea was that Cassie and I would have responsibilities on different areas of the farm. During busy times in those areas we would work full-time, while the other one of us worked shorter hours to provide support. 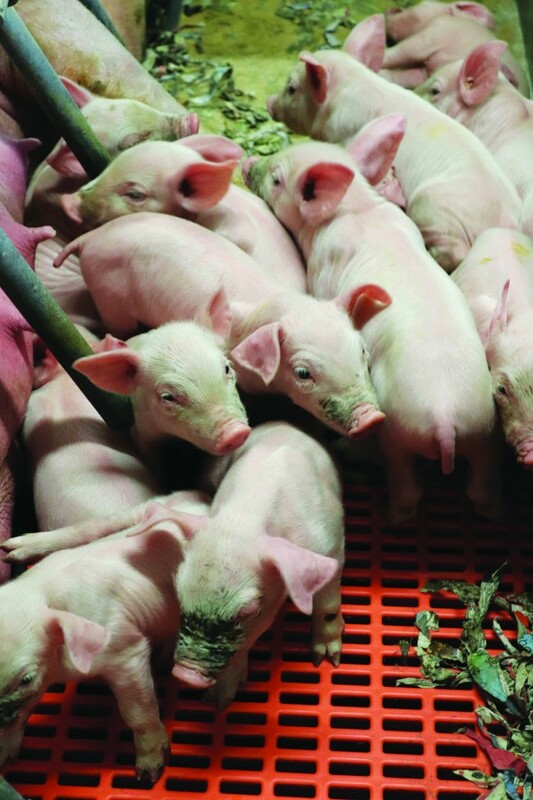 The flexibility of the role allowed the couple to gain experience in all aspects of pig farming and, over time, they noticed their respective strengths on the farm complemented each other and they were able to bounce ideas off each other. Tom said: “I had more of a liking for the farrowing house – the stockman development courses really helped me see that I could make an impact in this area. Cassie preferred the serving area – she’d come from an environment which needed lots of analysis and precision and this really suited working in serving. Together the pair produced video evidence for their suggested technique in introducing piglets to their milk cups and also a heat detection study to show sows were coming into heat too early under an old serving system. 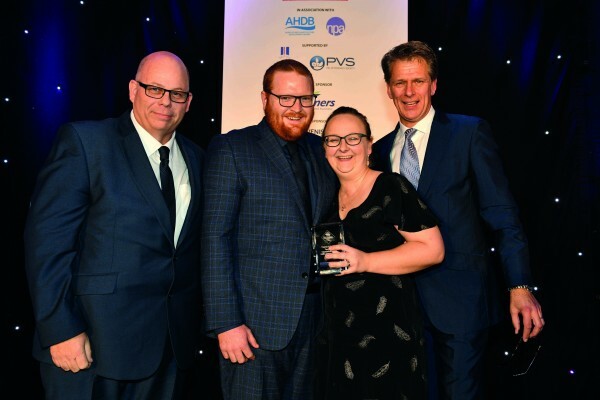 Training played a major part in developing the couple into their roles and Tom stressed the importance of staying in the loop with new developments in the industry. Training initially began for the pair on-farm and they also enrolled on the AHDB Stockman Development Scheme, completing the initial Stockman course in June 2017 and the Stockman Plus in May 2018 to ensure a wider understanding of the farm’s management. The pair also attended AHDB-sponsored gilt management training days and prioritised attending the Essex Pig Discussion Group each month. This allowed them to learn from peer experience and ensured they stayed up-to-date with industry best practice. Tom said: “Training is what has got us where we are today. We came into this industry as total newbies, and the training we’ve received and the people we’ve met have been so important. “Training has so far literally formed the base of our knowledge of the pig industry, and I will always be working to keep my knowledge fresh. In December 2018, Cassie left the job-share and is training to be an accountant. Tom said: “She was really interested in the mechanics of the farm as a business and felt that getting these new skills would be very useful. Looking towards our future, having skills and experience in business management seem pretty invaluable, especially in these pretty turbulent financial times. “She’s looking on this as another string to her bow and is absolutely loving the new challenge she’s taken on. She’s a very logical person and the problem-solving side of accounting and business management is a great fit for her,” Tom said. He conceded that he has got a lot busier since Cassie left the business, while learning how to use the record-keeping system, and the e-MB (Electronic Medicines Book) has been particularly beneficial. 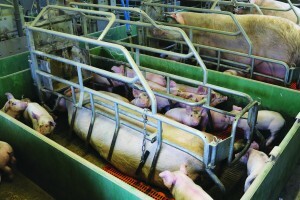 “I get more overview on how much medication has been used each farrowing, and can see any trends of illnesses clearer. Looking forward, Tom said he is really excited about the different ways in which the business can use technology to improve farming. He said: “In today’s world it’s becoming clearer that we have to improve farming efficiency to keep the world fed, and Cassie and I been very lucky working for Chris and Rob Leamon, as they are always open to new innovations in farming. 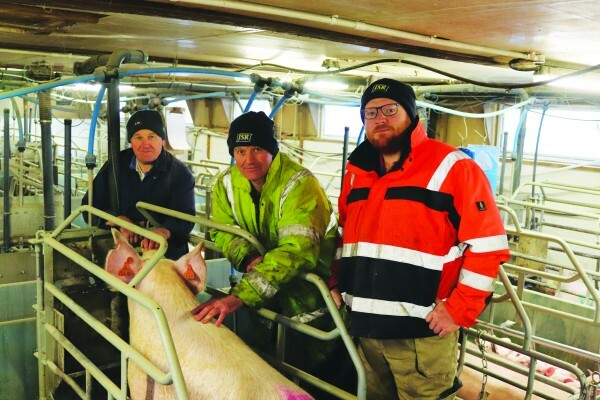 Their milk cup innovation has helped the farm increase the number of healthy animals raised per sow from 11.1 to 12.8, while weaner weights are up, from 8.1kg to 9.5kg. “We think it’s very important for the farming industry during these really turbulent times for producers to be able to run their farms in the most efficient way that they can,” Tom added. So what are the biggest challenges facing the industry? “The obvious one is Brexit,” Tom said. “What is going to happen here?! I think the biggest challenge with this situation is that it is not clear what its impact on British business and the farming industry is actually going to be. “It’s going to be very important to stay flexible, and to keep the farm running in as an efficient way as possible. I am totally in love with this industry, and have such a passion for it. I just want to learn, learn, learn. I feel like the next obvious step for me is to learn more about farm and people management. I really want to learn more about how pig farms run as a business.